Several years ago, I came across this book at a used book sale. After some research and help from my fellow Ravelers, I discovered that this book was published in the 1940’s in France and then translated into English. It is a publication of Laines du Pingouin. The book starts out with a note to Mothers that …”Little girls cannot learn to knit by themselves unless mothers have the time and patience to actually show them how to do it”. 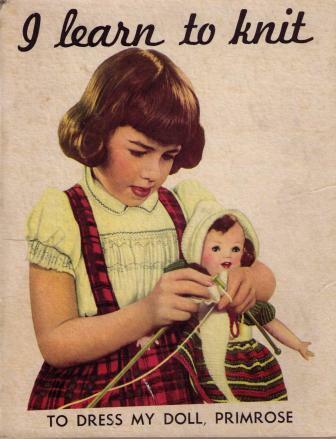 Then there is a story entitled “The story of my doll Primrose”. It’s a cute story about a doll at Santa’s House”. 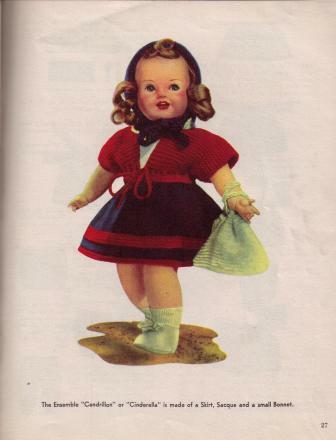 After the story is the second half of the book is devoted to teaching a child to knit and then includes the instructions for 4 complete outfits to knit for a 16 inch doll. I decided to make the “Cinderella” outfit. And, here she is. This was a lot of fun to make and very simple. I used Sirdar Snuggly 4 ply yarn and size 3 needles. Both the skirt and sweater have and i-cord closure. To complete the look, I added a simple blouse that I sewed together from some scraps of fabric and added a lace trim to the neckline. I enjoy dressing dolls, especially when I use vintage patterns. I like to think that in some small way, I’m passing on these patterns to future knitters.